and do a whole foods fast weight loss plan that’s healthy? Helping the obese beat obesity is Carlene’s passion. A fast weight loss plan that works for the obese and brings health that isn’t all raw is something she started offering years ago and for those that did it, gave almost as fast results as her Rawk Starz diet. Her Whole Foods Diva plan is the next best thing to her Rawk Starz Diva plan. The mindset of this program is how Carlene and most of the women in all those before and afters that brought you here lost their weight. It’s a no BS type of program and is only for the truly committed. And only for the obese. You need to lose at least 50 lbs to qualify for our whole food fast weight loss plan. Don’t be afraid of this program. Those of us who have been obese most of our lives need this type of discipline and fast weight loss plan to succeed. Carlene’s tougher here, but still understands what you go through and will only hold you accountable, not judge or shame you. A Whole Food Fast Weight Loss Plan, especially one this strict and structured is not for everyone. 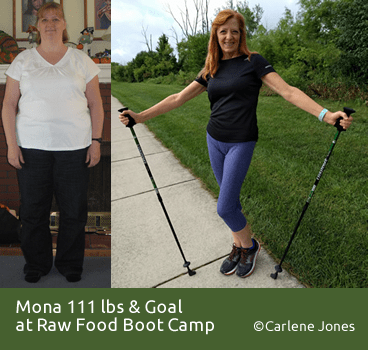 Before you apply for Carlene’s Wholy Rawker Diva program, peruse the Raw Food Boot Camp website. Take our quizzes, listen to the free audios, maybe even join our Free program. Learn all about us and Carlene. You can read her weight loss story at I Beat Obesity. Our Change with Carlene side of camp is not this tough and still brings nice fast results depending on how much you put into it. This Diva Plan only supports our Wholy Rawker diet plan with the alternations. All other whole food diet plans are supported in our Change With Carlene side of camp. You must have at least 50 lbs to lose to join. You must do our whole food fast weight loss plan, our Wholy Rawker Diet plan as written with the alternations mentioned for the Diva plan. You must be able to focus. Put blinders on and get to goal. Take the Questionnaire below to see if you have the mindset to do well in this fast weight loss plan. At 50 lbs Gone you must do a journey page for RFBC and at every 10 lbs gone add a short blurb to it. Through April 2019, those who join this program and have 80+ lbs to lose will be eligible each month with their 8 lbs gone to receive a half off coupon for their membership. You are Eligible but will have to push to win our 50 and even 100 lb Challenges which bring free time and $$. There are side effects to all fast weight loss plans. Be aware of them and be prepared for them. Detox happens for everyone. For Wholy Rawkers it happens sometime around the end of the first month. It usually presents itself as a cold or the flu. Or you may experience extreme fatigue. Some who have been on heavy meds in their lives may break out with rashes. Detox in our experience lasts about 4 days. You will feel like crap and think you are sick. You’re not. Get through it and feel so much better when you’re done. Regardless of the diet you’re doing, all fast weight loss plans cause hair loss. It will grow back, but it’s a pain when it’s happening. Most people before starting a diet binge big time. Our diet is low fat, so when you come from a high-fat diet to our low-fat diet there is a good chance you may develop gallstones. Make sure to check with your doctor. Gallstones are quite common with dieters. But they need to be managed and watched. The biggest mistake you can make is having a high-fat day before starting our whole food fast weight loss plan. No last hurrahs! This is the biggest fear expressed about this and all fast weight loss plans. I worried about this myself. Daily, I moisturized my skin with aloe vera gel and Suave’s Elastin and Collagen moisturizer mixed together. My results were a quarter of what I expected and the truth is I didn’t end up with loose skin, I ended up with wrinkled skin on my upper arms and inner thighs. Yes, I hated it, but it is easily covered with sleeves and longer shorts. About halfway through your weight loss, you may panic. Your skin/fat will feel all loosey goosey. I call this the watery fat stage. It passes as you continue to lose weight, but be prepared for it. Every body is different. Age, time obese, how obese, all play a role in how well your skin comes back. This is a major fear factor for many. My suggestion is you try it. Get to your goal weight and then decide. You will never know what the end product will be if you don’t get to goal. If you don’t like what you see, you do know how to gain the weight back. No one truly expects to live on the Rawk Starz diet for life. Most want to transition to some other type of diet be it vegan or not. We have a maintenance program to slowly transition you to the lifelong diet of your choice. But! Because you will lose your weight fast, practically with blinders on, you will bypass all the real struggles of weight loss. These struggles are vital in your ability to keep the weight off. Your first year, possibly two will be hit hard with all the bad habits you ignored, the cravings you ignored, and all the old ways of eating. In maintenance, there is no scale reward for staying on plan. No next goal. This makes it harder to stay motivated to stick to your maintenance plan. When you hit maintenance, you will have to work on the Change With Carlene side of camp to break those habits and the mindset that you’re thin you can now eat however you want. All fast weight loss plans are like this. Even weight loss surgery. You get your results fast, but you don’t learn much along the way. Be ready and willing to stick around and do maintenance with Carlene. The only true cure for obesity is to learn to take control of your food and eating issues. All or nothing types struggle with this. Be prepared for hard work long after the fat is gone. If not, you will gain all the weight back. Interested in being an RFBC Wholy Rawker Diva? Apply for our fast weight loss plan. For those who join us in April 2019 and have 80+ lbs to lose, if Carlene accepts you into her program, she will send you a code to get your first month of Access to Carlene at half off. If you complete the first month and participated at least 5 days of each week and lost at least 8 lbs in that month before you renew for the next month she will send you a new coupon. This will continue for as long as you are in the Wholy Rawker Diva program. If there is no submit button at the bottom of the form it is because you have not answered the questions up to the standard of commitment I require for the Rawk Starz Diva plan. Go back through the application and see if there are better choices that you can truly commit to. Tell me about that time. What Diet did you do. What was Your Reason for Leaving? The truth is while we all want fast weight loss, most can't sustain a tough diet and exercise program long term. Answer these questions honestly to make sure the Wholy Rawker Diva side of camp is the right one for you. There is more than one question, as you answer each one another question or Carlene's advice will appear. This side of camp is for the morbidly obese only. You have to have 50+ lbs to lose to join it. This is Old style Raw Food Boot Camp, the same strict guidelines all our 100 lbs in 7 Months Winners went through! Although they did the Rawk Starz Diva plan. How would you define most of your successes. I'm better at planning and moving forward in a calculated fashion even if it takes a little longer to achieve my goal. To do well in this strict program you really need to embrace the all or nothing mindset. If you can't put blinders on and run for goal, then you will do better in the Change with Carlene side of camp. You can still do the Wholy Rawker diet and exercise, just not with as much pressure on yourself to always be so on top of it. You may do better on our Change with Carlene side of camp. However, If you think you can adapt the all or nothing mindset go back to the previous question and choose your answer again. We have had women come to camp unsure of themselves the first month and then this run to goal mindset set in and they made it all the way. See CJane's 100 lbs in 7 Month Winning photos. She struggled and doubted the first month, but then she decided it was right for her and did it to win it. I do great and usually reach my goal in the time I allotted. It's keeping it off that throws me. Meandering along is the perfect mindset for the Change with Carlene side of camp. There is push, but not pressure, and trust me, I will do my best to keep that push in your mind so you will have the success you want. You can do the Wholy Rawker diet and exercise plan, but then switch it if it gets too hard to a diet of your choice. I'll support you all the way through. Trust me, you are a Change With Carlene type of gal! In my mind dieting is a temporary situation. When it feels like more than that, I quit it. My only true happiness seems to come from food. It's my lover and best friend. I can't seem to live without it. I don't care if I'm overweight, I only diet for how the world perceives me and that just isn't enough at times. It's not. When I diet, I diet and I don't let anything get in my way. Okay, I'll tell you the right answer on why you think dieting has been so hard. It's when you say it's not hard. But many have succeeded even though they admit food has been their lover and best friend. When they don't care if they are overweight they just want to fit in. They come and succeed even though they resent not fitting in or even think dieting is a temporary thing. It's that resentment and those mindsets that make people quit. The Wholy Rawker Diva side of camp is hard, but it's even harder if you resent having to do it or already know you won't stick with it. It is because of this that I created the Change With Carlene program for our regular side of camp. Think hard about what you are truly willing to do to succeed. If you want to continue the quiz go to why losing the weight has been so hard and select the option It's not. The Wholy Rawker Diva side of camp is an all in type of program. Carlene is going to give you her all, she expects that from you as well. You must treat the program like a part-time job. Be committed, not half committed. Think about it. If you can up your commitment, the pay off is worth it. Carlene and the program are worth it. But to be honest, Carlene has a hard time working with people who flit in and out or who won't ask for support when they need it. Commit and become a Wholy Rawker Diva and win your money back by winning our big challenges. You may do better on our regular side of camp. Can you honestly do these things and be content and happy knowing the results you will get this is what Carlene expects from you if she is to work with you daily in the Rawk Starz side of camp. If you can't check them all then the Rawk Starz Diet is probably not the right side of camp for you. Check if you can give up eating out at restaurants except to order plain salad or fruit bowl, regardless. Even if life dictates you have no choice. That means if there's nothing on the menu that you would just order water or tea and sit and be happy. Even wholy rawker food is tough at restuarants because they put oil and salt in everything. Check if when you do eat out and foods off our plan arrive in your plate will you send the order back or be able to not eat the off plan foods on your plate regardless of who you're with and where you are. Check if you will walk the full 2 hours even if you have company or are super busy or you have to work late into the night or are so tired you fear you will fall asleep on the treadmill. Heat and cold, ice and rain, children and others will not keep you from walking. You have 2 to 4 weeks to get to the 2 hours a day. Check if you will always stick to the plan and not find reasons why today can be different. This includes all indulgences including raw ones. Check if you honestly believe you have what it takes to just do, not try, no maybes, but just do the diet and exercise without compomise until you reach your goal. Check if you will honestly treat RFBC like a part-time job, be here daily, check in with Carlene and the Rawk Starz team daily, log your food each day, reach out to Carlene if you struggle, weigh in good or bad every Monday, Wednesday and Friday. Based on the checklist alone, I agree with you. You probably do have the personality to lose 8-12+ lbs a month on a continual basis in our Wholy Rawker Diva side of camp..
To achieve this you need to work closely with me, make RFBC a part-time job and just accept that you are going to do this all the way to goal. No excuses, no days off. Just here to get this done. No doubts or worries. On the walking, if you want the big weight loss you may have to push beyond the 2 hours a day more often than not. I got this type of loss but I was doing 2.5 - 3.5 hours a day of hiking. The bigger walking with our strict Wholy Rawker diet is what makes these big losses possible. All results are dependant on your body and how it works, but if you follow through with the all the checkpoints you marked you have a high probability of winning our big challenges and hitting goal fast. We still have all the personal changes to go through, but when you do this diet with blinders on and just get it done, a lot of the changes happen in maintenance. That is how I did this. Without your full commitment, Carlene's Wholy Rawker Diva program is not right for you. This is truly a boot camp atmosphere with Carlene in drill sergeant mode. The only ones eligible for this program are those who commit 100%. Our Change With Carlene side of camp is not as strict and may be a better choice. Carlene wants to be sure you're ready for that commitment all 12 of the above checkboxes needed to be checked to ensure you are here to get it done. No excuses, no justifications, no time off! Be honest. If you can't answer these correctly, then you will hate this program. Carlene has high expectations of everyone who joins this side of camp. Tell me about yourself and why you think this program and Carlene are the right place for you to battle your obesity and finally beat it. It is important to Carlene that the women and men who join this program are thoroughly committed. For those who are committed to sticking to our Wholy Rawker Diva plan. You will be expected to do your best each and every day. You can not take days off. You must participate in our daily discussions daily. No exceptions. No pretending you are sticking to our diet, be ready to face reality. That's not to say you'll be kicked out if you have a bad day, but your incentive to push yourself, to get back up and to not make excuses count. This is boot camp of old. When you're done, you have to be committed to transitioning to maintenance with Carlene. Carlene's goal is for you to beat obesity once and for all. Don't apply unless you are willing to give your all and treat this like a part-time job that matters. You'll be working with Drill Sergeant Carlene. This program is only for the truly committed. I acknowledge to maintain this membership I must participate at least 5 days a week to the programs daily discussions. I acknowledge that to maintain this membership I must lose at least 8 lbs a month. Carlene may give me a one month reprieve on this, but it will only be once. I acknowledge that I have to treat this like a part-time job. Exercise and being on plan are not an option. They are required. I acknowledge that weigh ins every Monday, Wednesday and Friday are mandatory. I agree to do Carlene's Wholy Rawker Diva Diet as it is written but with no bananas, grapes or mangoes. I will not deviate. I acknowledge this program isn't for those who can't put on blinders and stay focused. I know I can do this. To prevent spammers and hackers from hurting our database none of the information gathered here is saved. It will be sent as an email to both you and Carlene. Please hold onto your copy. Carlene reserves the right to select just those she believes will not only do the program but succeed in it. Returning members, don't assume because you quit before that you won't be accepted. I take everything into account. I will put more emphasis on how committed you were to camp and doing the diet as it is and walking than on how long you lasted.